The 47-year-old sought refuge at the embassy to avoid extradition to Sweden over a sexual assault case, which has since been dropped. 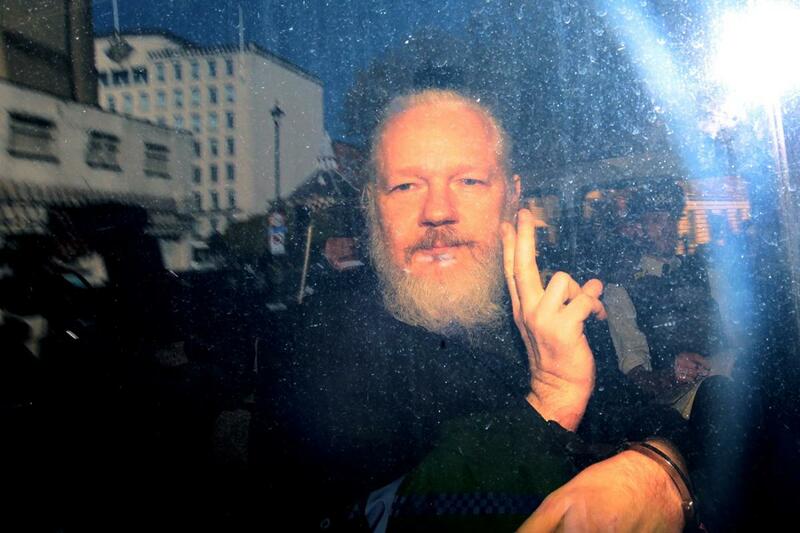 Police officers were invited into the embassy after the Ecuadorian government withdrew its offer of asylum to Mr Assange, according to Scotland Yard. He was "further arrested" on behalf of US authorities and will appear in custody at Westminster Magistrates' Court "as soon as possible". Here is how the internet reacted to the news. In a series of expletive-ridden tweets, actress Pamela Anderson came to the defence Assange. "I am in shock.. I couldn’t hear clearly what he said? He looks very bad. How could you Equador? (Because he exposed you). How could you UK? Of course, you are America’s b***h and you need a diversion from your idiotic Brexit bulls**t," she wrote. "And the USA? This toxic coward of a President. He needs to rally his base? You are selfish and cruel. You have taken the entire world backwards. You are devils and liars and thieves. And you will rot and we will rise." And American Whistleblower Edward Snowden branded the arrest a "dark moment for press freedom". He posted on Twitter: "Images of Ecuador's ambassador inviting the UK's secret police into the embassy to drag a publisher of, like it or not, award-winning journalism out of the building are going to end up in the history books. However, foreign secretary Jeremy Hunt was quick to come out in support of the arrest. "Julian Assange is no hero and no one is above the law. He has hidden from the truth for years," he wrote. 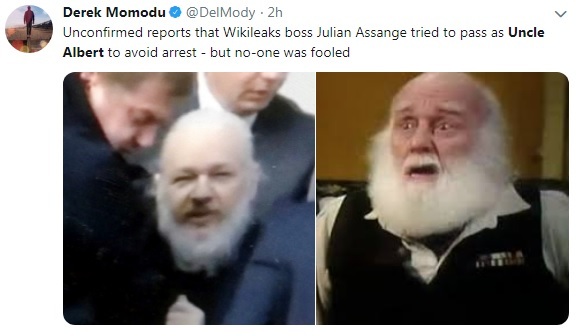 Some internet users took a more light-hearted approach to the arrest, comparing Assange's appearance upon his exit from the embassy to the Only Fools and Horses character, Uncle Albert. The term Uncle Albert is currently trending on Twitter because of the number of social media users making the comparison. "The fact Uncle Albert is trending is almost justice enough for Assange," wrote Twitter user Anne Fairweather. "Shocked to see Uncle Albert arrested! What did Del Boy do?" another said.